I’ve probably got a dozen little projects I’d like to take care of, but as the list grows longer, my motivation seems to get less and less. I’d prefer to just snap my fingers and wish that I was Mary Poppins, but instead, I’ve decided to follow the advice of the ladies that write a blog I read called Girl Talk. A couple of years ago, they suggested that we “Pick One Spot” to clean or reorganize, instead of thinking of the big, overwhelming list of things that you need to do at home. They also had a contest to see which reader could turn in the most impressive before and after pictures of mini-projects and I loved seeing the results. Make-overs of all shapes and sizes make me happy, so I’m hoping that documenting my own befores and afters will be inspiring! I started with my laundry room, but I forgot to take pictures since the idea of blogging about it hadn’t occurred to me yet. Sorry. But, you can come over any time and check it out. It looks great, mostly because I tamed all the Trader Joe’s bags that were out of control in there. A couple little friends were still showing some green and putting up a fight, but they were still a hot mess. And then here are the after shots! 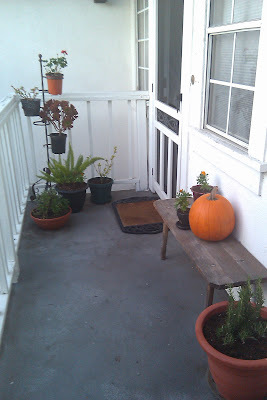 I really like how it turned out- newly potted plants, a swept porch, a delightful pumpkin. 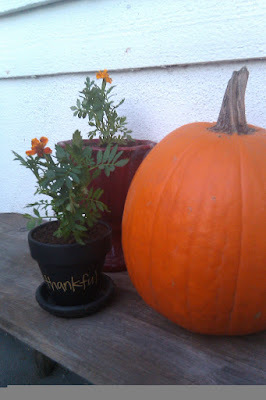 My favorite thing is the little pot covered in chalkboard paint that I made a while back and am finally using. 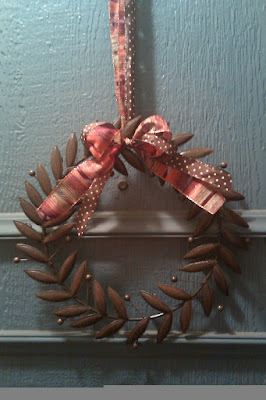 And thanks to a 40% off coupon from Michael’s and fall ribbon that’s already on sale to make room for Christmas, we have a new door decoration. Lovely. Three cheers for setting attainable goals! =) Send me pictures if you decide to pick one spot! Nice going! Way to set attainable goals! 🙂 Can’t wait to see it, and your laundry room! Very Cute! I love the idea of picking one spot. 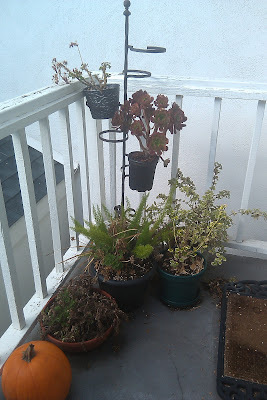 I can totally relate to plants coming to die. Looks great, dear, and good advice too. 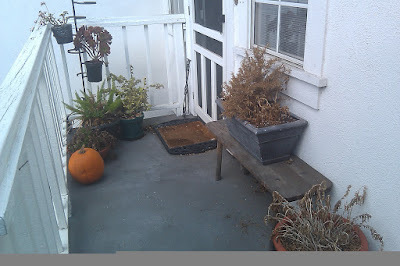 The porch looks great and I’m glad the dead plants are gone. Now the outside matches your beautiful home inside. Thanks for the inspiration.